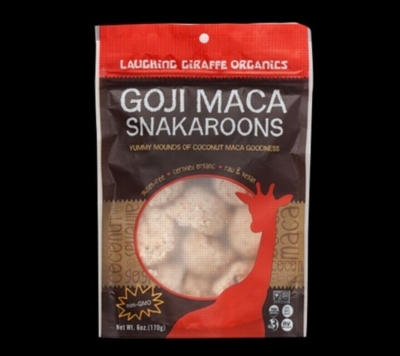 Satisfy your sweet tooth without sacrificing your health with the Snakaroons by Laughing Giraffe Organics. Choose from exciting flavors such as Aztec Chocolate, Coffee Bean, Banana, Salted Caramel, Vanilla and more. This snack contains delicious mounds of coconut and exciting ingredients like almonds, maca root, nutrient-packed Goji berries, real coffee and cocoa. Laughing Giraffe Organics offers quality, nutritional snack food made with only the purest organic ingredients. Their snacks are nutrient dense, gluten-free and minimally processed. Laughing Giraffe Organics is a family-run business that operates from San Francisco, CA. Order one six ounce bag or a six bag case.